Welcome to my E-books page. I am working on two books here right now. I hope to put links to them here soon. Refresh this page to get my newest information and design. Thanks! It's so fun to meet you. Welcome! and have fun here on my site. Click here to go to my Ebay Hints page. 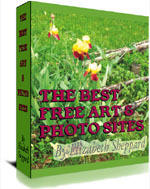 My free ebook for you is The Best Free Art and Photo Sites. It is a PDF file. Be looking for the updated version here very soon. Have trouble reading the PDF? You can download a PDF reader here. My newest ebook is Advice for new interns: What NOT to do as a new teacher. I am updating this book right now for a Second Edition. Look for my new ebooks page soon! TEACHERS - click here for the For Teachers page. You will find lesson plans and a signup to the Yahoo Group. NEW - click here to go to my Classroom Management Page. My website is updated often. Email me to make offers, suggestions, report a link, barter or trade, or just say hi. Website ©2007-2012 by Betsy's CGC - Collectibles, Graphics and Consulting.